Another great finishing in our slightly famous Anima Negra casks. Anima Negra is a highly regarded winery on the island of Mallorca, they make some of the finest red wines in Spain, predominantly from local grape varietals. We have released several whiskeys that have been finished in their fine French oak casks and this is one of the best. These casks seem to have a great affinity with Irish whiskey and they tend to add delicious flavours of cola, spice and dried citrus fruits. Just 334 bottles have been released of this edition. Nose Aromas of fresh fruits, apples, cola, mace, orange peel and papaya. Palate Sweet and spicy with vanilla, mace, allspice, dried citrus peel, chocolate and malted milk flavours. Finish Full, rich and sweet. Distillery Undisclosed, double distilled on the island of Ireland. Types of Barrel used for Aging Refill sherry casks followed by a finishing in an Anima Negra red wine cask. Any Additional Information of Note Non-chilfiltered, un-coloured. Celtic Cask Aon 1996 was distilled at Cooley Distillery and in 2010 was finished in an 80 year-old P.. Initially aged for ten years in first fill bourbon casks followed by a further finishing in a 2nd fi..
Celtic Cask “Ceathair” was matured in 1st fill Bourbon casks for 10 years. 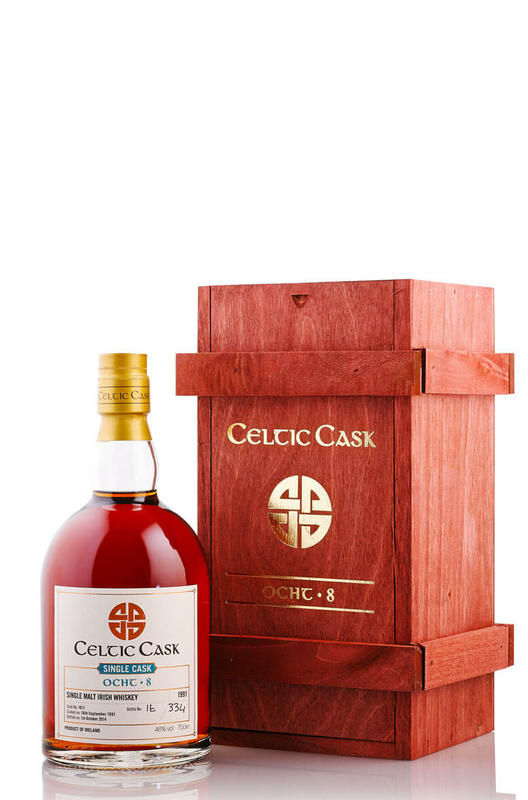 In December 2..
Celtic Cask “Cuig” was triple distilled in Ireland in 1991 and was matured in a first fi.. This cask came to us via the Teeling whiskey company and is just over 22 years old. This is a double..
A richly flavoured and smoky single malt that was initially matured in a single Bourbon cask then tr.. This is certainly on of the most interesting releases in the Celtic Cask range. For the Seacht we to..